Of course, I'm talking about a Bob jogging stroller; the Bob Revolution jogging stroller in navy blue and white to be as specific as possible. As I am training to get in shape for the police academy, or simply to keep up with Catchr, I have been jogging almost every morning for the past month. It has not been easy, as my lifelong bout with insomnia makes for some pretty hard morning runs. And mid-day temperatures in the upper 90s keep any sane person from setting foot outdoors. But, I've taken it upon myself to try and make a good impression on my son, and so I have decided to take him with me. Sort of. My wife seems to feel that she would like to keep up with our little triathlete, as well, and has also decided to take up jogging/running. She is 5' 2” and has had no problems getting back into jogging, while pushing the Bob Revolution. I have run with the stroller on one occasion and had no problems with it at all, and I'm 6' 1”. It seems inconceivable that a couple that is incapable of performing a non-comical slow dance could share the same stroller, without handle-height adjustments, but it works. The price tag for the Bob strollers is a little steep, but while in REI, my wife and I had two separate Budinskies tell us what a great stroller the Bob was. Now, I tend NOT to take unsolicited advice, but we were already in the market for the stroller (I had done significant amounts of research on the stroller beforehand), so I shook my head and dispensed with the pleasantries. However, some people don't get a clue and when one these self-proclaimed Bob-vangelists began to touch the stroller I was looking to purchase, I let her have it. “Who do you think you are? Don't try and show me the safety lanyard that attaches to the axle to prevent tipping, incase the runner falls down. And I don't really care that the front tire can be locked in position to make the stroller more stable when I run,” I said to her in a stern voice. “So you don't care that there is ample storage below the stroller to carry a small diaper bag for your child? Or that the stroller will easily fit into the trunk of your Honda Accord?” she retorted. She hurried out the door without uttering another word. And I quickly moved to the checkout line to pay for my new stroller and get home. 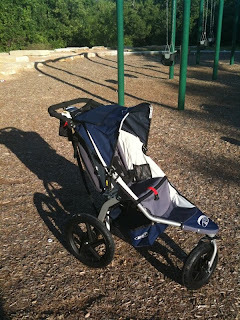 Catchr and I have not yet found any complaints about the stroller, but I still have nightmares about that strange lady. I still have nightmares. It has 3 inches of travel in the suspension (it is pretty cushy). It does NOT have a drink holder (those are an extra $20) and this is my only complaint. The front wheel has adjustable tracking when it is locked out, to maintain a straight ride. All three wheels are easily removed without the need for tools. Even with the wheels on, the crazy lady was right...it fits in the trunk of our car more easily than our full-size Graco stroller...AND it feels lighter. My favorite line: I don't think that's covered under the 5 year warranty. I would have loved to have witnessed this conversation.